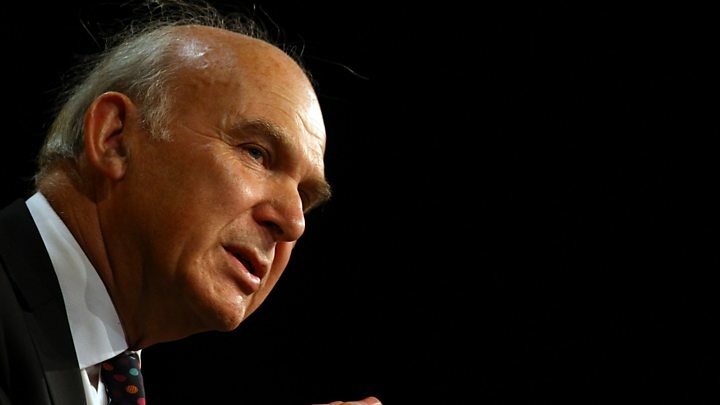 Sir Vince Cable will stand down as Lib Dem leader "once Brexit is resolved or stopped"- and wants non-party members to vote for his replacement. In a speech, Sir Vince set out plans to transform the party into a "movement for moderates". Party sources say he wants to see this delivered while he is still leader and wants to stay in his job for crucial Brexit developments. He also wants to continue campaigning for a second EU referendum. "He has a set of objectives rather than a timeline," a senior Lib Dem source said. The Lib Dems have 12 MPs - down from the 57 they had in 2010. The party has struggled electorally since 2010, when it formed a coalition government with the Conservatives and remains in single figures in the opinion polls. 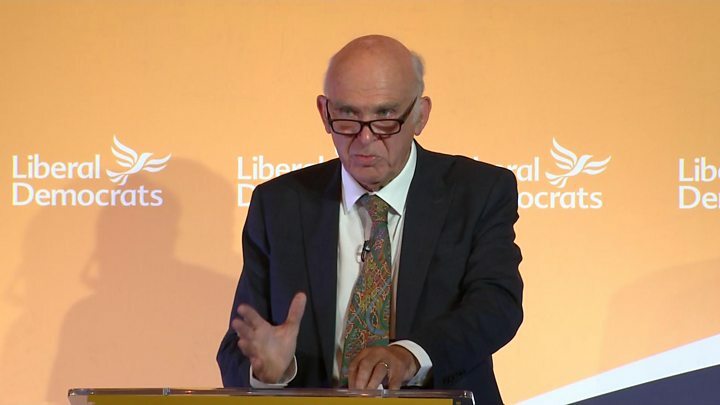 Sir Vince has predicted a realignment of British politics, as Labour and the Conservatives split over Brexit and it is thought he wants to ensure the Lib Dems, who are campaigning for a second EU referendum, are well placed to work with any new "centre ground" groups. The former business secretary told an audience in Westminster: "I think we have to recognise that despite our best efforts, the Liberal Democrats might not be the only centre force in British politics. "I think it is the worst kept secret in Westminster that political disquiet in the two major parties, is provoking some people to consider a new party of the centre ground, or several. And I think this requires us to demand better than the usual tribalism, whether that is our own or others." Sir Vince added: "Liberal democracy itself is under threat notably in the USA, in eastern Europe and perhaps here. Authoritarians and extremists of both right and left are on the march." Some Conservative and many more Labour MPs feel increasingly ill-at-ease with the direction their party is going in. There have been conversations over summer barbecues about creating a new party, or breaking away from the old ones but there's certainly no agreement about what happens next. Tony Blair and Sir Vince Cable share the belief that there are millions of voters on what they call the centre ground who feel homeless. Sir Vince is offering to put a roof over their heads - but it's hard to imagine dozens of Labour MPs sidling over to the Liberal Democrats. The tribal nature of British politics is deeply ingrained. Sir Vince's answer is to open up his party to outsiders in an attempt to attract a broader range of support and maybe a different pool of political talent. He seems to be saying to those who share his liberal values and his anti-Brexit stance, that he can supply the vehicle for their journey. But without an obvious figurehead, it's hard to see how these disparate voices can become more than a crowd of disillusioned politicians, grumbling about the status quo. The Twickenham MP said he wanted to transform the Liberal Democrats from what he called "an old-style political party" into a "movement for moderates" and had held discussions with some unnamed Labour and Conservative MPs. He advocated a change to the party's rules, so someone who was not an MP could be leader, and "liberal minded" people could sign up to the Lib Dems for free and get the right to vote for the leadership. He said he did not want to follow in the footsteps of Liberal prime minister William Gladstone, who served into his 80s - or fellow octogenarian leader Robert Mugabe but added: "Reports I have read of my imminent departure are very wide of the mark. "Now is not the time for an internal election, there is serious work for me and the party to do. "Once Brexit is resolved or stopped, that will be the time to conduct a leadership election under the new rules." His proposed changes would have to be approved by party members and will be discussed at their conference in Brighton later this month. Sir Vince took over as leader in July 2017 without a contest following the resignation of Tim Farron. The Liberal Democrats had 99,200 members as of August 2018. The Labour Party changed its membership rules under Ed Miliband from an electoral college system in which union members, MPs and party members had one-third of the vote each to a "one member one vote" system, which allowed "registered supporters" to take part for a £3 fee. Labour's membership swelled in 2015 and it is thought to have had about 540,000 members as of April 2018, up from around 190,000 in 2014. But there were claims that the new rules were fuelling "entryism" - allowing other groups to infiltrate the party in an effort to promote their own agenda. It is thought that Sir Vince plans to rewrite the rules so that supporters need to be enrolled for 12 months before voting, to prevent infiltration by rival parties.